How to take Limousine Bus 6030 from Incheon Airport to Itaewon? Do not worry if you have a lot of baggages because there are designated space on the bus and under-compartment to store them. Just remember to collect them when you arrive at your destination. The next arrival bus stop will be announced in English, Korean, Japanese and Chinese (Mandarin). 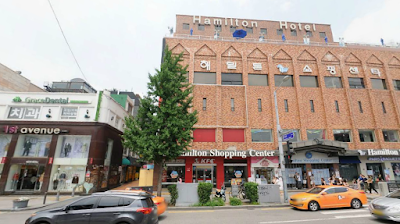 If you are taking limousine bus 6030 from Incheon Airport to Itaewon Station, you can alight at Hamilton Hotel Bus Stop at the main street of Itaewon. This bus stop is next to EXIT 4 of Itaewon Subway Station on LINE 4 of Seoul Metropolitan Subway. Alight bus 6030 at Hamilton Hotel bus stop which is located at Itaewon Station (Subway Station). 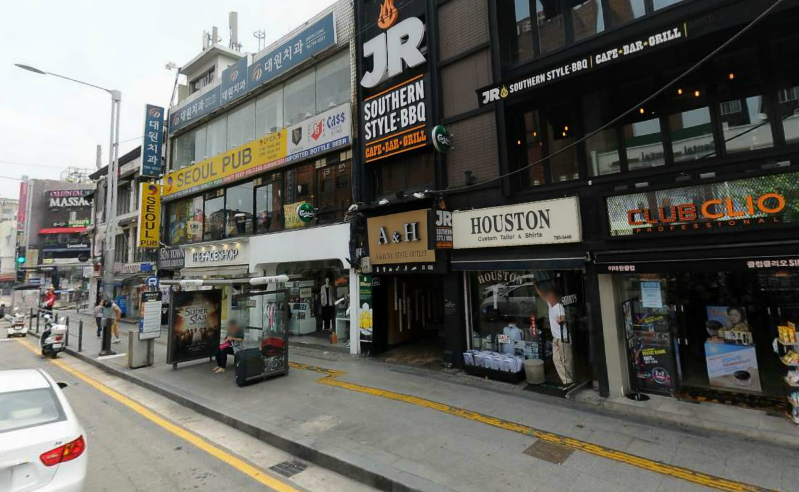 The Hamilton Hotel bus stop is located right at the main shopping and sightseeing street of Itaewon. EXIT 4 of Itaewon subway station is located a few steps from this bus stop at the cross junction. The 1st Avenue and historic Hamilton Hotel and Hamilton Shopping Center in Itaewon is just across the street from this bus stop. There are also pubs, comestic shops and restaurants along this street. Limousine bus 6030 from Incheon Airport will take about 1 hour 20 minutes to reach Itaewon. There is a bus departing from Incheon Airport to Itaewon every 25 to 30 minutes throughout the day. According to the bus schedule from Incheon Airport to Itaewon, the first bus to Itaewon departs from Incheon Airport at 6.30am early in the morning and the last bus departs from Incheon Airport at 11.00pm before midnight. If you plan to take Limousine Bus 6030 from Itaewon to Incheon Airport, you can catch the bus at the same bus stop as your arrival bus stop at Itaewon. If you are taking early flight at Incheon Airport, you can take the first bus at Hamilton Hotel bus stop at Itaewon at 4.32am early morning. Be sure to be there at least 10 minutes earlier to avoid missing the bus because the bus is usually quite punctual and arrive according to the bus schedule. If you are taking late night flight at Incheon Airport, the last bus for bus 6030 from Itaewon to Incheon Airport is departing from Hamilton Hotel bus stop at 10.22pm. The frequency of the bus is also about every 25 to 30 minutes throughout the day. How to go from Incheon Airport to Itaewon? In short, taking limousine 6030 is the easiest way to get from Incheon Airport to Itaewon. The fare is affordable (15,000Won). Unlike taking airport railway, there is no need to transfer from AREX train to subway at Seoul Station. For those reasons, many tourists who have a lot of baggages and travel with young children and elderly prefer to take limousine bus 6030 from Incheon Airport to Itaewon. Too bad. Maybe it would have been useful. Where do I buy ticket for the return trip? Or should I just pay to the driver? Yes, you can buy the ticket from the bus driver. Your limo should look as awesome as you do on that exceptional event. A limo can influence you to closely resemble a mogul and it gives you extra room in the auto and a sheltered ride. limousines, and superlimins, often also called partisan buses, On Inkas Limos you can find more and more luxury limousines on rent. Can i use t money / t card for the limousine bus? how long does the 4:30am bus take to go from itaewon to incheon airport? or what time does the 4:30am bus arrive at incheon airport. Hi Amin, did you find out an answer for this? As I have an early flight and not sure if I'll make it if I catch the bus. Any help would be great . Cheers.